Rumani was a high range of sand dunes with scattered oases and palm trees, in Sinai about 35 kilometres from the Suez Canal near the Mediterranean Sea coast. From 18 May 1916 the regiment conducted patrols to the east. On 21 July reports indicated Turkish forces were approaching Rumani on a front of 16 kilometres. 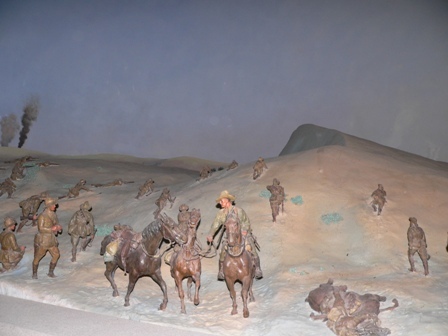 This patrol work was very strenuous for both men and horses, but casualties were light as it was not the job of the unit to get heavily engaged. The night patrols were officers’ patrols, generally two officers together, gathering much information. On the night of the 2-3 August, the enemy occupied Katia, a palm oasis about 8 kilometres south east of Rumani. Next night the brigade took up a new line of outposts covering what had been left as an open approach for the enemy. The 1st Light Horse Regiment was in reserve. At 01:30 on 3 August, the Regiment was ordered out as the Turks had made a forced march and were attacking the outpost lines. A Squadron reinforced the line held by the 3rd Light Horse Regiment south of a prominent sandhill. B Squadron took up a line on either side of the same hill, with the remainder of the Regiment covering two re-entrants to the north. The enemy was in force, the regiment came under heavy rifle, machine gun and artillery fire. At 10:00 the Regiment fell back behind an infantry line at Bir el Maler 10 of the regiment had been killed, 30 wounded. Enemy aircraft had spotted for the Turkish guns, dropped bombs, grenades and darts. On 4 August at 04:00, the Regiment drove forward with the 6th Light Horse on the left and the New Zealand Mounted Rifles on the right. The enemy withdrew under pressure to Katia. At 14:30 on 5 August an attack was made on Katia by the 1st and 2nd Australian Light Horse Brigade, New Zealand Mounted Rifles Brigade and 5th (British) Mounted Brigade. The regiment dismounted on the western edge of Katia swamp with a frontage of 250 metres, an advance of 3-600 metres was made into the swamp with the enemy dominating the high ground, this and subsequent attacks faded. However, the enemy had lost his strength. 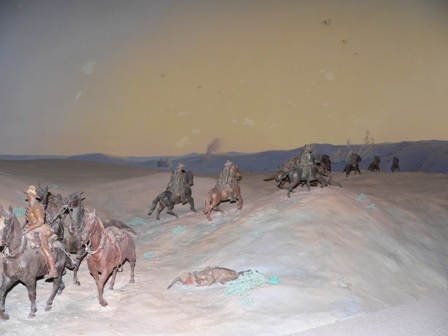 The ANZAC Mounted Division had successfully halted the Turkish advance on the Suez Canal.